SPIKE AXES- MOSTLY TOMAHAWKS BUT A FEW TOOLS--CAN YOU TELL WHICH ONES ARE TOOLS? 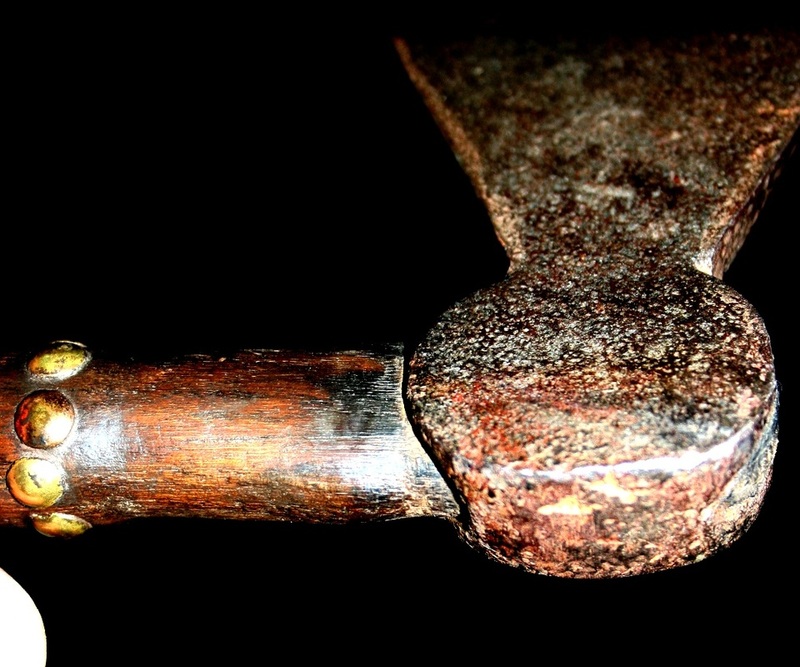 Spike tomahawks are thought to have originated from early ship boarding axes which closely resemble them except for the iron strapping on the sides of the handle. As with the other types of tomahawks, the terminology varied with the times & the places. How do you know it is a spike tomahawk? This is a very difficult category of tomahawk to discern since there are so many tools that could be mistaken for them. Some are easy to ID and some are difficult while still others are nearly impossible to determine their use. Naturally those that fit the classic patterns and cannot be mistaken for anything else are going to be worth the most. 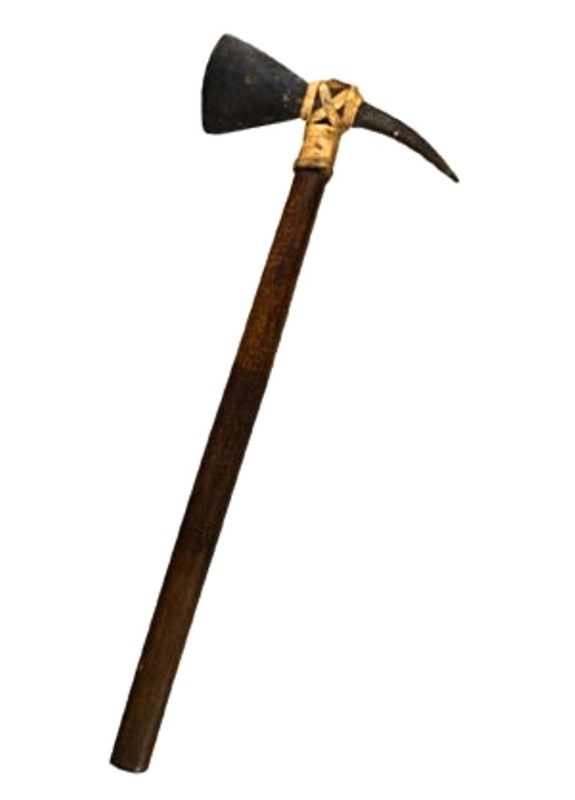 Due to their variability I realized that the only way to be sure you have an authentic spike tomahawk is to also be able to identify all the other types of axes that could possibly be confused with them. That is not an easy task since there are so many obscure trades that also used spike axes. IE. 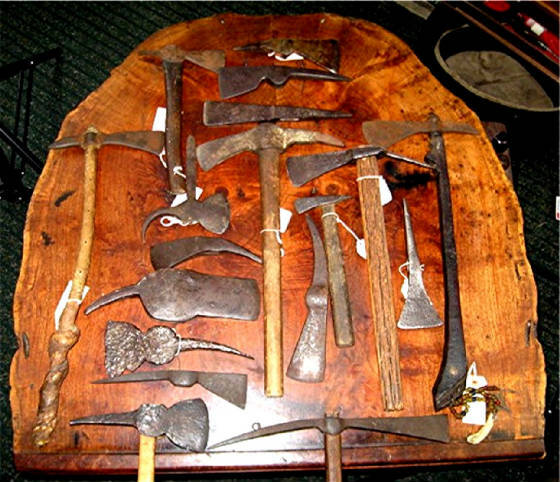 fire hatchets, ice home hatchets, ice axes, taffy hatchets, sugar hatchets, fraternal hatchets, coal mining hatchets, Hungarian herding hatchets, reproductions cast from originals, altered axes, faked axes, etc, etc., etc. Ruling all of those out is always the first task at hand. Most spike axes are missing their original period handles so often we have only the head to determine age & use. Here are some of the characteristics to look for in the 'average' specimen but keep in mind these are not absolutes. The more these attributes you can check off on a particular spike axe then the more likely it is an original spike tomahawk. Ironically, no book has ever been published outlining these typical characteristics. -weight of head in less than 1 lb. Most weigh ~0.5 lb. -evidence of proper age, i.e. pitting, darkening of iron. Anything that could be made then can be made now. -blades typically the same length as the spike or less. Ice hatchets & fire axes typically have blades longer than the spikes. - shapes & styles not commonly found on known ice hatchet, fire hatchets, mining hatchets & other tools. -average authentic haft lengths are ~ 10"-16"
- a blacksmith's trade mark is so rare on these that if it has one it should be suspect. They do exist but with extreme rarity. -is it different from all the other types of spike axes used throughout the world in history?...such as a 19th C. Hungarian fire hatchet, fokos or an early Austrian ice climbing axe? This is a tough one few have attempted and it takes many years to do, but it can be done. If you don't want to spend the time doing all this yourself then buy from someone who has and is trustworthy. (see pages 17-20 & pg. 30 for more examples of tools that resemble spike tomahawks. Some look to be the right age but will have perhaps an adze end instead of a pointed end which indicates it was designed as a tool and not a weapon. Some axes designed as tools were indeed rarely used as weapons & some have been found in Indian burials. They were also buried with tools because they believed they would be needed in the next life. I would not presume that ALL axe like tools are Indian used weapons & without verifiable provenance there is no way to determine that. 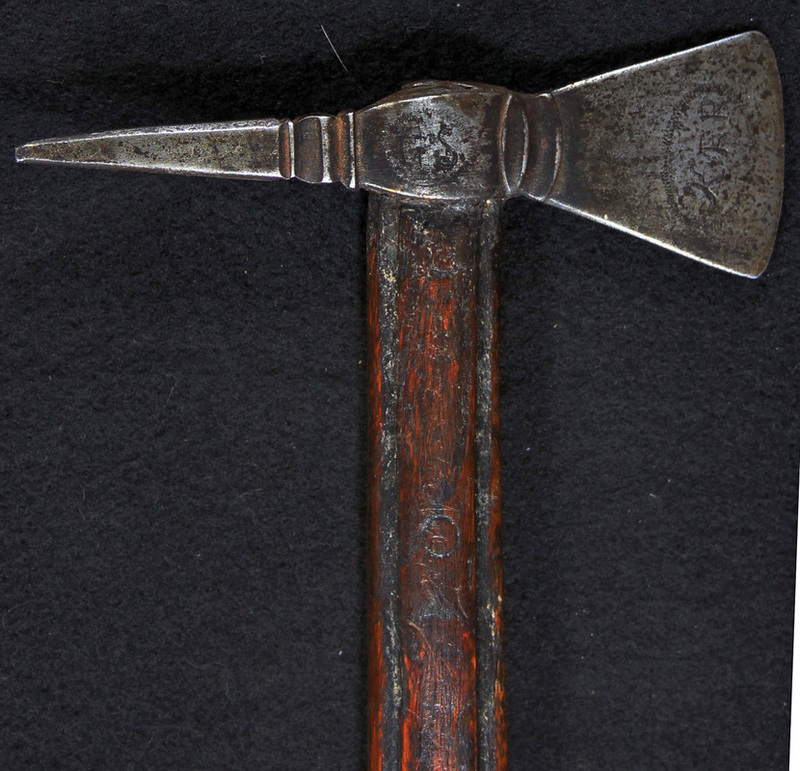 Miners, firemen & home ice box users all used short handled spiked axes which very closely resemble what we are looking for which were designed for their specific trade . Could the Indians have used those items? Again, it is extremely rare & there is no way to say for sure in most cases. It would be extremely irresponsible & beyond credulity to assume they did without more evidence. Indians commonly used plain looking butcher knives that were traded to them, but so did every American farm household. Identifying ALL old butcher knives as though from the Indian/fur trade exchange doesn't make much sense either yet people buy them as such constantly. In the words of Sigmund Freud, "Sometimes a cigar is just a cigar." 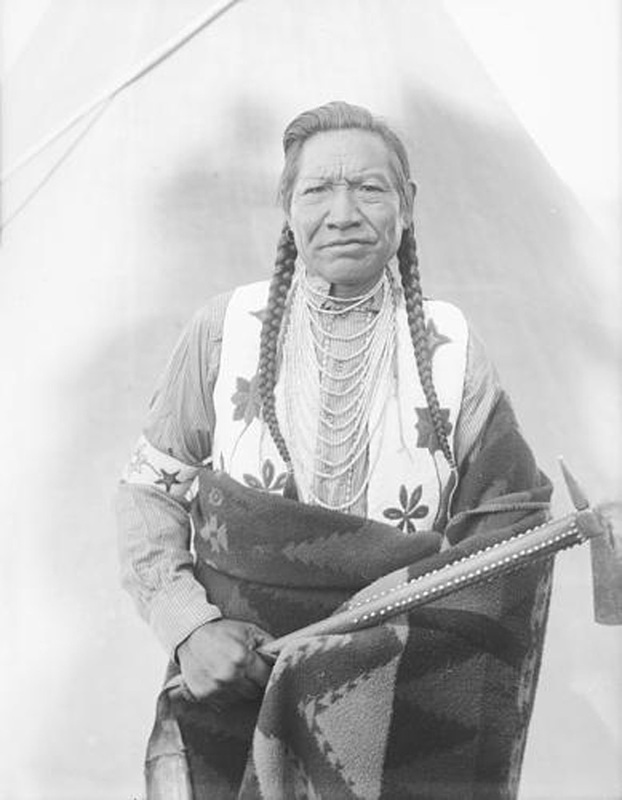 "Tomahawk and battle axes are not thrown at their enemies, as is generally represented, but are secured to the wrist by a strong cord, and only used at close quarters..." In accounts of other tribes, they describe throwing tomahawks as a fine art honed by constant practice until they can hit a target while on the run with nearly unerring accuracy. So it all depended on what time period and what location as to whether they threw them or not. Spike tomahawks were for the most part made by individual frontier blacksmiths rather than imported. This is clear from their wide diversity of shapes & their scarcity in the trade lists. Some were steeled at the edge or made entirely of wrought iron that were in some instances (if not all) case-hardened. This one was found in a home by the West Branch of the Susquehanna in PA. about 40 years ago from an elderly woman who had it for a life time. This area was inhabited by the Munsee Lenappe tribe. 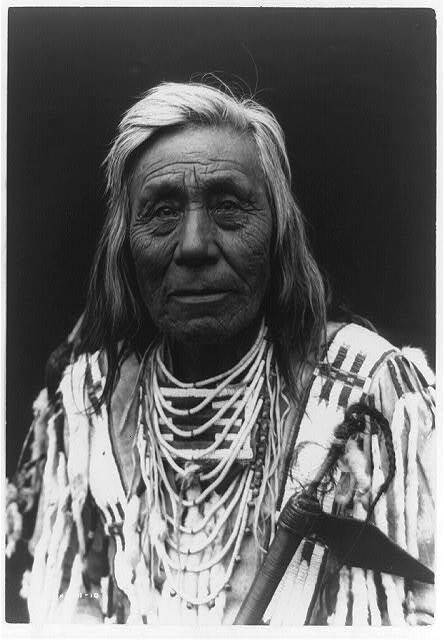 By the early 18th C. they had died from disease or war & the remaining were absorbed into neighboring tribes. Luckily this one survived without someone deciding it needed sharpening. 8" X 15"; circa late 17th C. to mid. 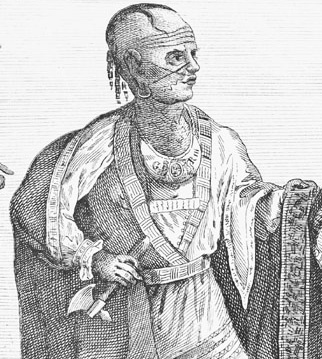 18th C. Identical heads are shown in Kuck's book Tomahawk's Illustrated. This 18th C. spike tomahawk head made from an old file (a great source of steel on the frontier) has a very finely beveled surface. There are a total of 12 surface facets. These are a very rare find and usually damaged due to the very fine needle sharp spikes and narrow blades. A great example of what fine artisans these frontier blacksmiths were. The haft is one I made. Mid 18th C. spike tomahawk with period hickory haft. 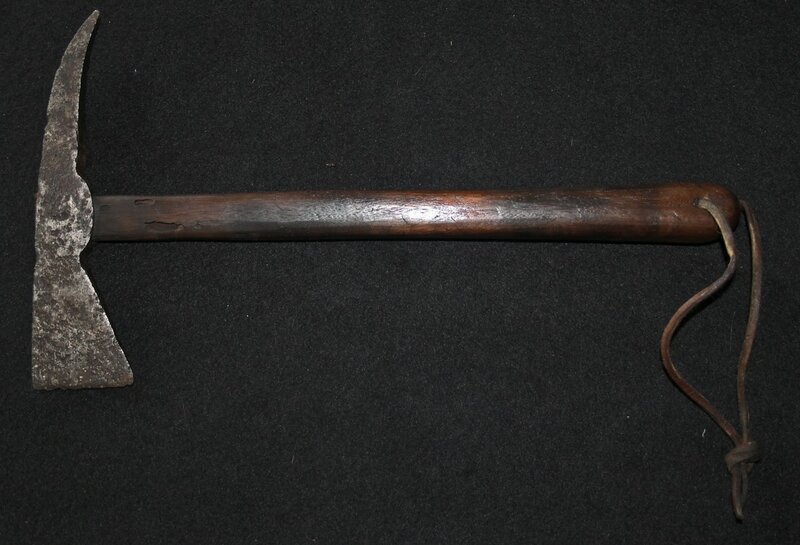 Circa Mid-late 18th C. spike tomahawk from New York state w/ modern replacement haft. Head weighs a mere 7.2 oz. The tomahawk below could be classified under a separate category but really it is a form of spike tomahawk. It is called a spontoon tomahawk. 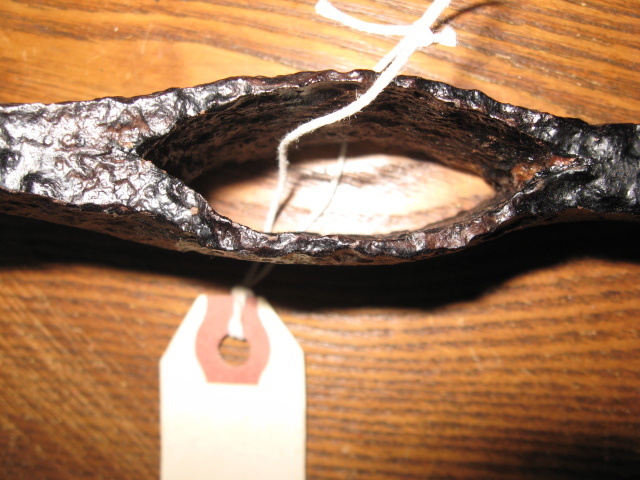 Notice the eye is shaped much like the missouri war axe eye or trade axe with the round eye. This was a Western plains item. Merriweather Lewis described one and drew a picture of it in his journal 1805 although he referred to it as a 'battle axe'. This next picture is from a group of Salish Indians delegates who have come to Washington D.C. in 1884 to discuss terms of a treaty. This is a closeup in that group of the very rare individual actually holding a spike tomahawk in a photo. Notice the finely rounded edges and the arrowhead-like shape of the spike. 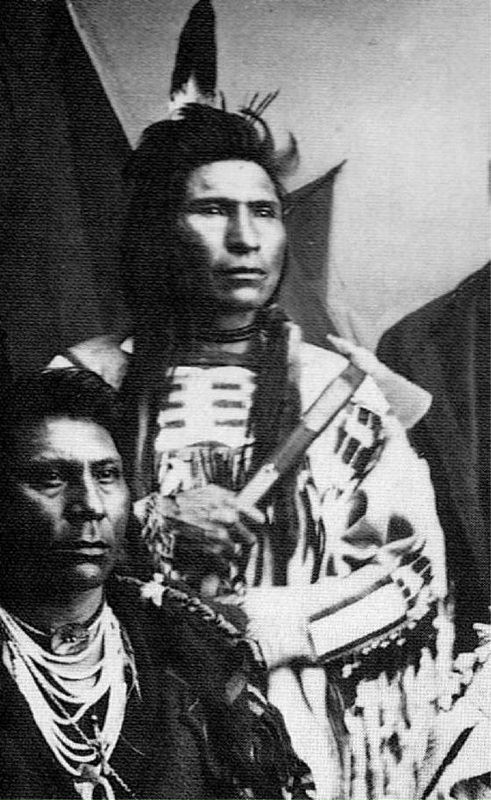 Photos of Indians holding spike tomahawks are extremely rare. This next Salish spike tomahawk appears very similar as the head on the one above however its more elongated and with more defined sections. 17th- mid18th C. French spike tomahawk found by Robert Bennett in Harbor Springs, MI area. Spike had been blunted in use. Here is another spike tomahawk found in Missouri which somebody decided needed a good cleaning before they sold it. That 'patina' was evidence of its age that is now gone forever! .The purported French 1695 Bonaventure tomahawk. 6.75" X 2 7/16" X 7/16" thick X 18" long overall. According to the owner in 2010, the linguist Frank Siebert (his father) inherited this in 1935 from Louis Lolar, a Penobscot who was one of his Penobscot language consultants. 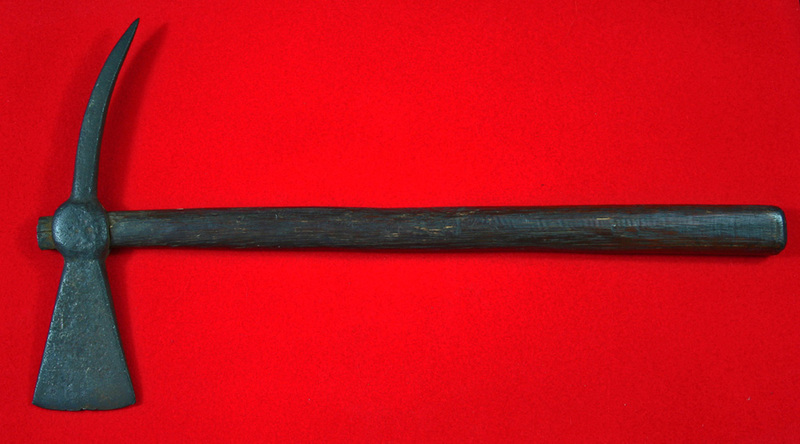 C. 1770-1790 Spike Tomahawk, from Albany, NY area. These were commonly used by Iroquois although I think other tribes also used them. Haft is not original. Heres an obviously dug spike tomahawk which nobody bothered to document where it came from. The location can tell us perhaps what tribe used it, what country probably produced it and perhaps even date it. Once that key piece of information is lost, it is lost forever. Perhaps there was a record of it's origin somewhere, but it didn't follow the axe when it went into an estate sale. Thats why I attach the labels to them. PLEASE label your collections. It only takes a minute. This spike axe was formed by sandwiching 2 layers of iron over top of each other with a mandrel or drift to hold the eye open. This is sometimes referred to as a Spanish method but it is really a misnomer. The method was practiced widely by many different areas & countries. 9.25" DUG --No provenance; PLEASE LABEL YOUR COLLECTIONS!!! This spike tomahawk came out of a New Mexico collection but probably originated in the East. It appears the spike was broken off during the period in use & repaired for continued use. A little over 7 1/2" long this spike tomahawk head dates ~ late 18th C. to early 19th C.
This spike tomahawk was dug from Quebec City at the base of a home site built in 1647. It probably dates later though since there were battles on that particular site up to 1760. Photo courtesy of Giles M.
This overall triangular form with slightly rounded ears has been found previously in an Ontario arch. dig site. Here is an unusual and very rare one. The mark "KRR" rocker engraved on the blade indicating the King's Royal Regiment of New York & on the center portion on the 2nd photo is "2 B" thought to indicate the 2nd Battalion. They were volunteer soldiers in the upstate NY region along the Mohawk & Hudson rivers who acted much like Roger's Rangers using the same tactics as the Indians. The other initials are "L.S." 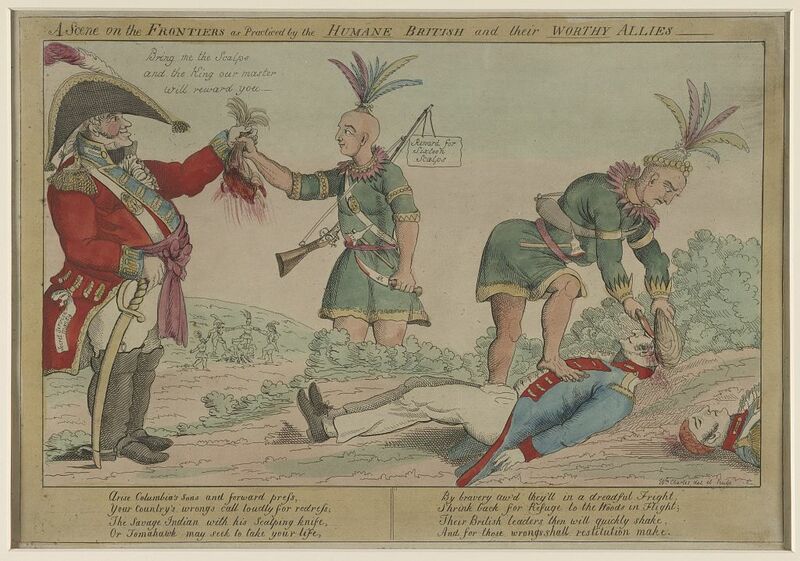 likely who it was presented to--probably the British Loyalist soldier in NY. during the Revolutionary War. There were only two soldiers of that Battalion that had those initials & that was Lawrence Sills & Lidwich (or Ludwig?) Snider. Also on the 2nd Battalion's roll was a John & George Sills so perhaps this Lawrence Sills was the one who owned this. 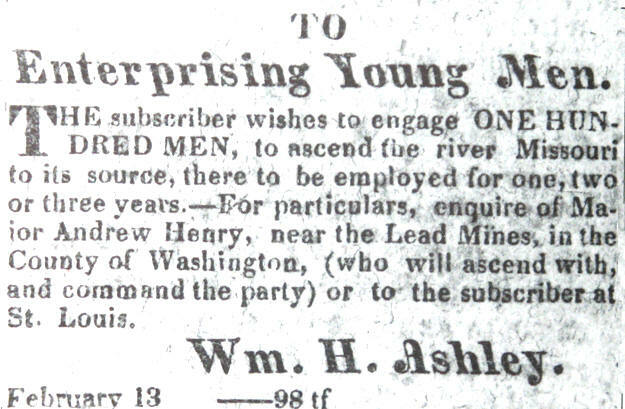 A 'Mr Sills' happened to have the enlistment record in 1869 & appears to have been handed down from Captain Fraiser of that company. If anyone has any further information that might be helpful on this please contact me. Besides this being so ornately created the relief wood carving simulating the iron strapping found on naval boarding axes also lends credence to spike tomahawks being descended from them & as such is a unique & valuable historical piece. On a scale from 1 to 10, this is a 10. "It is my land, my home, my father's land, to which I now ask to be allowed to return. I want to spend my last days there, and be buried among those mountains. If this could be I might die in peace, feeling that my people, placed in their native homes, would increase in numbers, rather than diminish as at present, and that our name would not become extinct."